Commercial Electrician Jackson, TN: Are You Opening a New Business? Opening a New Business? We Can Help! Opening your own business requires quite a bit from a person, particularly in the beginning. When you’re first starting, you’re the one who is responsible for coming up with a business plan, doing research, finding investors, hiring employees, and more. This is true even if you have a business partner! The good news, however, is that once you have those things out of the way, owning your own business can be a particularly rewarding experience. There’s nothing in the world quite like having your own vision for a business. Whether it’s a retail store, a restaurant, or something else entirely, one thing you might not be thinking about is working with a commercial electrician. Not to worry, however, because in today’s post, the team at Delta Electrical will highlight a few of the ways that we can help to get your business started off on the right foot. Keep reading to learn more! Are You Searching for a Commercial Electrician in Jackson or the Surrounding Area? Whether you’re starting a new business in a completely new building or you are repurposing a previously existing building to suit your needs, there’s a good chance that you’ll need the help of a commercial electrician. We can do everything from troubleshooting electrical issues to installing emergency and exit lighting. Need a new service panel? We can handle it. Looking to create a business that is energy efficient? We have you covered. Interested in upgrading the lighting in the parking lot? We’re here for you. If you’re opening a brand new store and you need someone to handle the electrical work from the ground up, we’d be glad to help you come up with a plan that suits your business’s needs. Alternatively, if you have specific ideas, we can do our part to make your dreams a reality. What Do You Get When You Choose Delta Electrical? What makes our electricians different? Well, to put it simply, we’re licensed and certified to do the work that needs to be done. In other words, we’ll get things done the right way the first time around. It’s as simple as that. When you choose Delta Electrical, you’ll be working with a team that is dependable, timely, and affordable. At the end of the day, our goal is to lend a helping hand however we can. There’s nothing quite like seeing a business get off to the right start and we’re always glad to be a part of the process. We’ll offer a level of customer service that is simply unmatched as we seek to provide you with the highest level of professionalism, integrity, and fairness. No matter the job, we would absolutely love to offer our support. 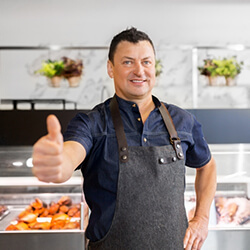 If you’re getting ready to open a business and you’d like to get an idea of how we can help, don’t hesitate to contact us today to get a free estimate. Opening your own business is a wonderful thing and when you work with the team at Delta Electrical, you’ll see that we’re committed to excellence. We look forward to hearing from you!